1. To activate the LED flashlight, please turn on the power button firstly, and then hold it for 2s. To turn off the flashlight, hold the power button for 2s again. 2. While using AC power, please ensure power indicator button is ON, and then turn ON the AC switch, the AC indicator light will change to green from red once succeed. 3. If no device connecting to the power bank within 40s, the LCD screen will light off automatically. Small Size but Enormous Battery Capacity- The size L7.3*W5.1*H1.2 Inch makes it easy to put in your handbag. 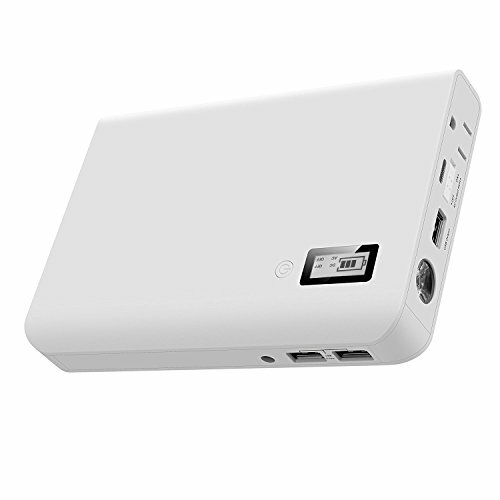 24000mAh capacity enables charging all kinds of smart devices. Charging iPhone 6s up to 13 times, iPhone 6s Plus about 8 times, Samsung Galaxy S4 about 7 times, iPad about 3 times and tablets several times. Charge up your Apple devices with our short lightning cable( ASIN: B01COHUU1A or B01E3CE9AM), neatly power to keep you going, and going...and going. Equipped with 1 AC Output & 3 USB Ports- Charge up to 3 USB-charged devices and 1 laptop/ tablet/ notebook or whatever you want to charge up simultaneously. Great for home, traveling, camping and more. USB output power reaches to 5V/3.1A, AC output 110V/ 60Hz. Included AC/DC adapter will charge the unit itself within 3 hours. Superior Quality- Built-in integrated Grade-A Li-ion battery for convenient charging and 500+ charge cycles, during the course of its life, together with the most advanced materials and cutting-edge technology, to ensure complete safety. Smooth and Matte Design- The exterior case covers with a sturdy scratch resistant matte rubber oil finish. LCD indicator screen displays power level. Turn ON/ OFF/ Activate the LED flashlight with one button. Transfer AC output with one switch. Safety Certified- CE, FCC, ROHS certified, approved for airline travel. Made of heat-resistant ABS, built in high quality PVC copper wire, premium circuity with over-heated, over-charging protection and short circuits.